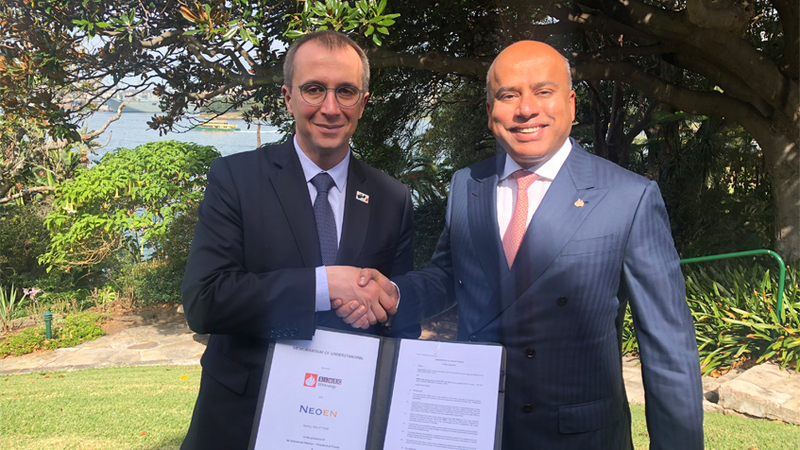 NEOEN and GFG Alliance have signed a landmark agreement designed to dramatically reduce energy costs to industry in Australia. The two renewable energy producers have signed a Memorandum of Understanding to work together to develop, operate and supply renewable energy at a far lower cost than ever before. As a first step, the two companies have signed a 15-year power purchase agreement (PPA) that will see SIMEC ZEN Energy – part of the global GFG Alliance – take most of the output from NEOEN’s 100MW Numurkah Solar Farm in northwest Victoria, which is already supported by a 38 MW Green Certificate Purchase agreement by the Victorian Government. NEOEN CEO, Xavier Barbaro said the signing of the agreement, which was witnessed by Australian Prime Minister Malcolm Turnbull and French President Emmanuel Macron, reflects a shared commitment to deliver low-cost, sustainable energy solutions into the market. “The switch from fossil fuels to renewable energy is the revolution of this century, transforming our economies and our impact on the environment. Such major change demands sustainable, effective solutions,” Mr Barbaro added. GFG Alliance Executive Chairman, Sanjeev Gupta said the PPA would help ease energy costs pressures at GFG’s Laverton steel works in Victoria, and provide ‘exciting opportunity’ for the companies to work together to find global renewable energy solutions of even greater scale. “These agreements reflect GFG and NEOEN’s shared commitment to the goals of economic and environmental sustainability that are strongly advocated by President Macron and Prime Minister Turnbull,” Mr Gupta continued.